I already wrote about flatforms back in January, but new ones keep coming out as more and more people get excited about this trend! So I decided to create a second set of flatforms for all of you! Let's be perfectly clear though; these are NOT flatforms: These super cute Joie shoes found at Saks are platform wedge sandals. 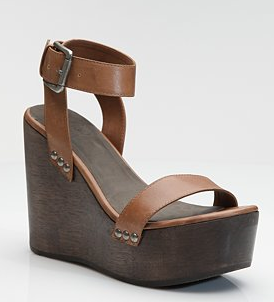 They have a nice 2" platform, but the heel raises up, making it comparable to a 2.5" heel. That is extremely NOT flat, people! I would like to boast that I think every shoe I found below has a pitch of less than 1.75" which would have the be the very max that can pass as a flatform.